MC&S offers a variety of rock crushing and screening services to accommodate your most unique needs. The crew at MC&S work around the clock to ensure your order exceeds expectations. Portable rock crushing and screening can be done state wide. Crushed aggregates, crushed base and screening of materials available as well. Limestone aggregates available by the ton, yard, and truck load. Crushing in your pit or ours. We are here to assist you with your project, large or small. 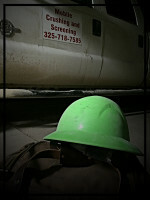 Mobile Crushing and Screening Inc. This service is available any where in the state of Texas. Quality processes and quality equipment lead to the highest quality screening in the state. Mobile Crushing & Screening offers custom screening to meet any of your project needs from fine chat to larger entrance rock and more. Mobile Crushing & Screening Inc. operates 2 pits to maintain full stock of bulk aggregrates to meet the demand for any industry. Products range from chat and road base to #57 stone and 3x5 entrance rock. By the yard, ton or truck load. These products are available at our 2 west Texas pits near Garden City and Water Valley TX.